Welcome to the website of Liz Calvert Smith, where you will be able to find out more about the work of a food historian. Dining was a very risky business in the nineteenth century, you could never be quite sure exactly what you were eating. Of course, the adulteration of food was nothing new; it had probably existed in some form or another as long as people had sold or bartered food. In fourteenth century London, for example, people were fined for selling, amongst other things, stale fish, stinking pig meat and wooden nutmegs. 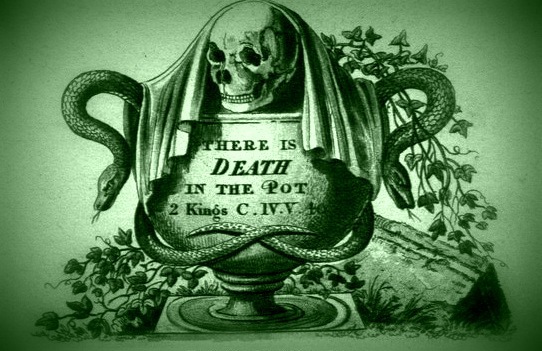 There were laws to deal with deception, but any admixtures were difficult to detect before scientific testing, which only became possible some five hundred years later. Medieval testing was along the lines of sprinkling powdered unicorn’s horn into wine to test for poison; if present, it would change the colour. This was never proved with certainty. What was well known, and accepted by some, was the use of mineral salt called alum to whiten the bread and improve the volume. Alum is an astringent, and whilst not especially harmful, it caused serious digestive problems in those whose diet consisted of very little other than bread. The housewife obviously had to add chemistry to her already long list of skills. One imagines that by the time she had finished testing and found most results positive, she had probably lost her appetite anyway. Perhaps the most surprising feature of all this is the immense scale on which adulteration was practised. It was not until the Food & Drugs Act of 1872 that analysts were appointed throughout the country and food adulterers began to be prosecuted. To complete the look, how about a Georgian dinner? 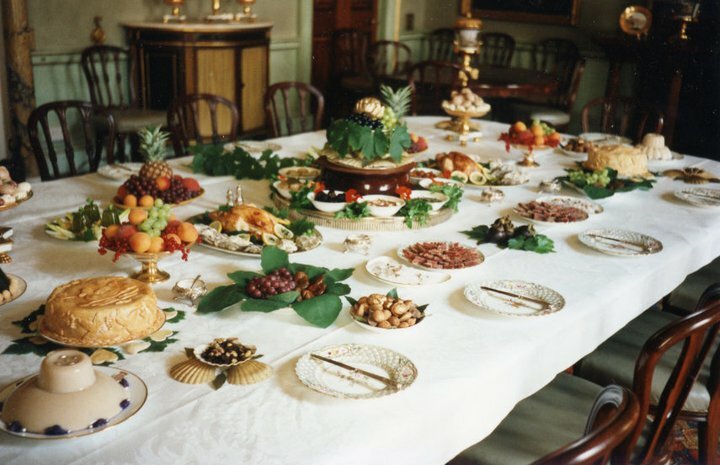 Liz Calvert Smith feasts her eyes on cooking and dining in the 18th century. Leg of mutton with oysters, ducks á la mode, transparent pudding covered with a silver web; it is hard to believe that these elegant dishes were produced in the Georgian kitchen, where cooking methods had scarcely changed for centuries. Most of the food was cooked over a large open fire; hot, dangerous and difficult to manage as, no doubt, was the cook by the time she had finished. Meat was roasted on a spit fitted onto the front of the grate, turned mechanically by a clockwork spitjack, and basted constantly. Maintenance of the fire at just the right hear was of prime importance, and the cook was also instructed to “observe, in frosty weather your beef will take half an hour longer.” It is interesting to note that this is true roasting, whereas meat cooked in the oven is really baked meat. Boiling was the other usual method of cooking. Pans were large and heavy; they had to be for recipes like Scotch barley broth which began, “take a leg of beef chopped and four gallons of water…” Cooks had to be strong as well as heat resistant. Perhaps surprisingly, most of the authors of cookery books of this period stress the need for ‘delicate cleanliness’. Spits and pans were to be scoured with sand and water, while oil and brick dust were not to be used for fear of tainting the meat. In large homes, stoves built of brick had been in use since the end of the 17th century. They had small firebaskets set into the top, were fuelled by charcoal, and provided a gentle heat for preparing sauces and delicate dishes. However, the fumes could be unpleasant. In his diary of 1800, Parson Woodforde described how his niece became giddy by standing too long over the charcoal stove making jam. Of course, ovens were in use as well. They were made of brick, domed or arch-shaped, with a door of iron or oak, but they had to be ‘fired’ or heated before they could be used. A fire was lit on the floor of the oven and allowed to burn for up to two hours. This was then swept out, the door was shut tight and the oven left for ‘a little while’ for the heat to be evenly distributed into the brick walls. I have tried this a number of times, and found that the only way to judge when the temperature is right is by experience. So much depends on the type of wood used in the firing. Bread was baked first, and then pies in the ‘falling heat’. If the oven was well managed, the whole range of decreasing temperatures could be utilised, the coolest being used for making puffs (now called meringues) or even for drying herbs of feathers. In sharp contrast to the heat and bustle of the kitchen, the dining or eating room, as it was originally known, was a haven of taste and elegance. For the fortunate , food was abundant, servants were plentiful and cookery was developing into a fine art. A seemingly endless stream of books on the subject was published during the century and, despite Dr Johnson saying, “Women can spin very well, but they cannot write a good book of cookery,” most of the bestselling books were written by women. The dinner hour had gradually moved from around noon at the beginning of the century, to early evening by the end of it. This is only a generalisation, as times changed more slowly in country areas where old habits died harder. The choice of ingredients increased steadily throughout the century; largely because of improvements in agriculture and roads. Vegetables were no longer frowned upon by medical men, and soon formed part of the daily diet of both rich and poor, the latter eating mainly roots and greens. Exotic fruits were much sought after and those who could afford them had orangeries built, or grew pineapples in specially constructed pineries with ‘lofty stoves’ or ‘fluid pits’. It was considered particularly stylish to serve fruit and vegetables out of their usual seasons. Richard Bradley, a cook, mentioned this when he wrote “the pride of the gardeners about London chiefly consists in the production of melons and cucumbers at times before or after their natural season.” We take this for granted now. Although often quoted, it is unlikely that anyone ever began a recipe with the instruction “First catch your hare…” Originally, it may have been “first case (or skin) your hare,” but whatever the truth of it, 18th century cooks were certainly much less squeamish then than their descendants were to become. The Cookery Of England by Elisabeth Ayrton (Penguin Books). Recipes taken from all periods since the 15th century. The London Art Of Cookery by John Farley (Southover Press). First published in 1783 – recipes from the London Tavern. The British Housewife 1756 by Martha Bradley (Prospect Books). 18th century cookery, housekeeping and gardening. 1. Why did you decide to become a food historian? I have a history degree and I’d always enjoyed cooking, so I thought it was a great way to combine the two. Also, you can access so much social history through finding out how people’s culture and social standing affected how and what they ate – after all, food is the one thing we all have in common, wherever we live, whoever we are. 2. What’s the best thing about being a food historian? Where to start! So many things – it’s such a rich, endless subject with so many different avenues to explore. Social history, medicine, geography, literature and many more. The research, meeting such interesting people, seeing some wonderful places – beautiful stately homes, museums and different parts of the world. 3. What can we expect to see on the blog in future? I’m planning to put a lot more photos of work I’ve done in the past, alongside articles I’ve written for magazines on a variety of subjects including ice houses, tea, pleasure gardens and remedies. Also, I’ll write regularly about different aspects of food or food history – seasonal, regional, cultural – why not suggest something you’d like to know more about? You can contact me on liz@edible-history.com or find me on Facebook or Twitter.